Shimeharitsuru “Jun” junmai ginjo. An old friend. The large swooping kanji in calligraphy is “Jun” (“pure,” as in pure rice sake, no alcohol added). One of the pleasures of sake, at least for me, is revisiting old friends. As much as I am in search of the new, the untasted, the learning experience, I often come back around to some sakes I know that are solid, faithful, and fit my tastes very well. Shimeharitsuru “Jun” junmai ginjo is one of those old friends. I think I tasted it the first time in the summer of 2007 with my then drinking partner, Patricia, at Tomohiro, a tiny izakaya in Yokohama that features Niigata sakes. Patricia and I had decided to try to visit some of the izakaya that John Gauntner wrote about in his books, Nihonshu no Umai Otona no Izakaya (a guide to Tokyo-area sake pubs) and The Sake Handbook. Oh yes, it is delightful to slide open a tiny door and enter, we two American women, to sit at the bar and take in the scene of cluttered glassware and bottles, the posters of Japanese beer girls and sumo banzuke, the humming fridges full of sake, the smells of tempura and braised eggplant, and thus become completely absorbed in the evening’s tastings. My notes that night were pretty terse, “Sweet rice nose, clean.” But I put a check mark next to it, my way of telling future me to go back for more. I tasted it again when John Gauntner featured it at the first dinner of the January 2008 Sake Professional Course. My notes expanded somewhat and I wrote of its “cotton candy nose” and “classic” profile, plus the fact that it was made of gohyakumangoku rice. I’ve since learned that I often really (really) like sake made from that rice. I smacked my lips on it on December 31, 2009, at Sushi Taro, before picking up my osechi. That day I drank it heated, which gave it tones of caramel. And tonight I finished a bottle I had been enjoying over the past few days. It has a clean crispness (crisp cleanness?) 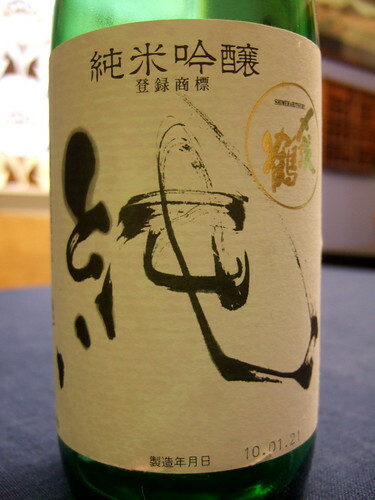 typical of a sake from Niigata Prefecture, but the nose is gentle and sort of coy. Tonight that cotton candy nose was there with a slight banana undertone. A delicious tartness refreshes the palate and keeps me wanting more. Tonight I drank “Jun” with gyūniku no misozuke (“miso-marinated beef,” but we marinated veal chops). I wrapped veal chops (non-factory farmed) in cheesecloth along with some crushed garlic. I spread some inaka miso I had in the fridge mixed with mirin over the outside of the cheesecloth and let it sit a few hours. Then I removed the cheesecloth and grilled the veal. The meat was outstanding, carrying that slightly fermented salty taste that makes me think of Japan. Be careful when you grill it, miso marinades tend to make meat burn more easily. The recipe was from the May/June 1998 issue of Saveur, but a quick search shows me that the author, Hiroko Shimbo, published the same recipe in her later book, The Japanese Table. The recipe is floating around Indra’s net if you want it. Why aren’t you going out and finding a bottle right now?